Get the single, Hello, Hello. What’s Your Name?, and learn how to say greetings in English. Hello, Hello. What’s Your Name? is one of the most popular BINGOBONGO Rock songs ever, and kids never want to stop singing this rockin’ song. SKU: CD1-05-mp3 Categories: BINGOBONGO Rock Vol. 1, BINGOBONGO Songs, MP3 Tags: BINGOBONGO Rock Vol.1, Hello Hello. What's Your Name? BINGOBONGO Rock Song: Hello, Hello. What’s Your Name? This BINGOBONGO song, Hello, Hello. What’s Your Name?, teaches kids the most important thing in English: how to say, “My name is” and “Nice to meet you.” This fun song can be used in the classroom with any number of students to get to know each other. ESL students of all ages and levels will pick it up almost immediately and sing it all day long. 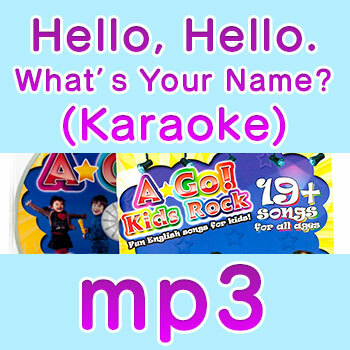 The karaoke track is also great for letting students sing along with their own names. Hello, Hello. What’s Your Name? My name is Jeremy . Nice to meet you Jeremy. Nice to meet you Glenda. Nice to meet you Chris.